Order your own copy of Whispers of Shadow and Steel at your local retailer or online through our website today! In the clan infamous for its liars, schemers, and secrets, Bayushi Yojiro is known as the “only honest Scorpion." As an Emerald Magistrate, his duty is to uphold the Emperor’s laws and ensure justice is done. As a Scorpion, his duty is to loyally serve the interests of his clan—even if that means sacrificing his own honor. As both, Yojiro walks a line as razor-thin as the edge of a katana. 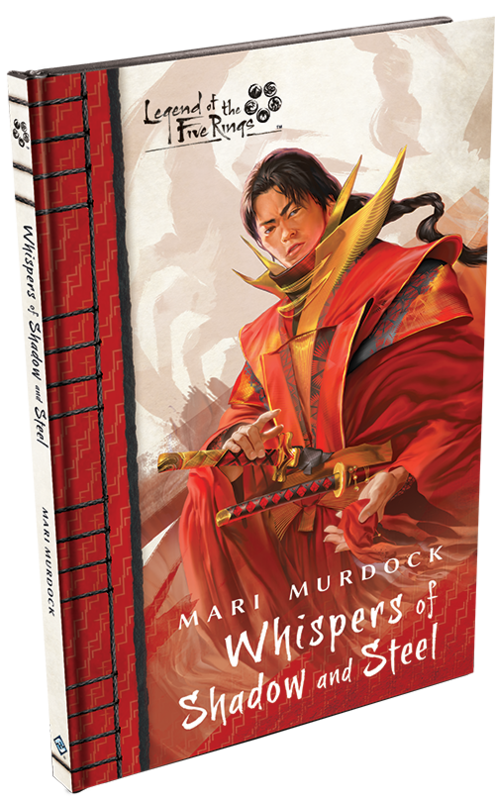 Whispers of Shadow and Steel, a Scorpion Clan novella by Mari Murdock set in the world of Legend of the Five Rings, is available now from your local retailer or our website! This 112-page novella focuses on Bayushi Yojiro, the Honest Scorpion, as he investigates a mysterious death in the City of Lies. 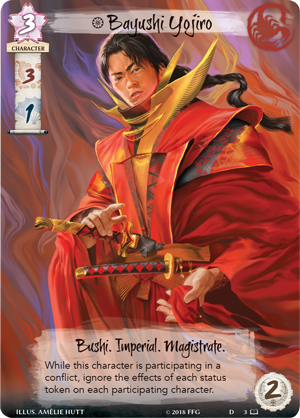 The novella also includes a sixteen-page color insert giving deeper insight into the Scorpion Clan and three copies of two full-art cards for Legend of the Five Rings: The Card Game! Whispers of Shadow and Steel examines the duality of the Scorpion, and what happens when the clan that puts duty above all else has its loyalties tested. While the story in the novella examines the Scorpion’s present, the color insert takes a trip to the past, chronicling the very origin of the clan from the story of Bayushi’s first followers to the purely fictional tales of ninjas in the land of Rokugan. This insert is your view into the world of Hantei’s villains, and makes Whispers of Shadows and Steel a must for any fan of the Scorpion Clan. 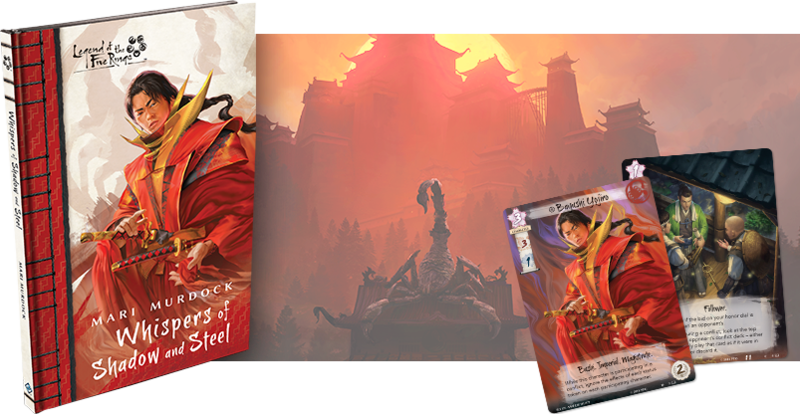 Every copy of Whispers of Shadow and Steel will also include three copies of two full-art versions of cards from Legend of the Five Rings: The Card Game! 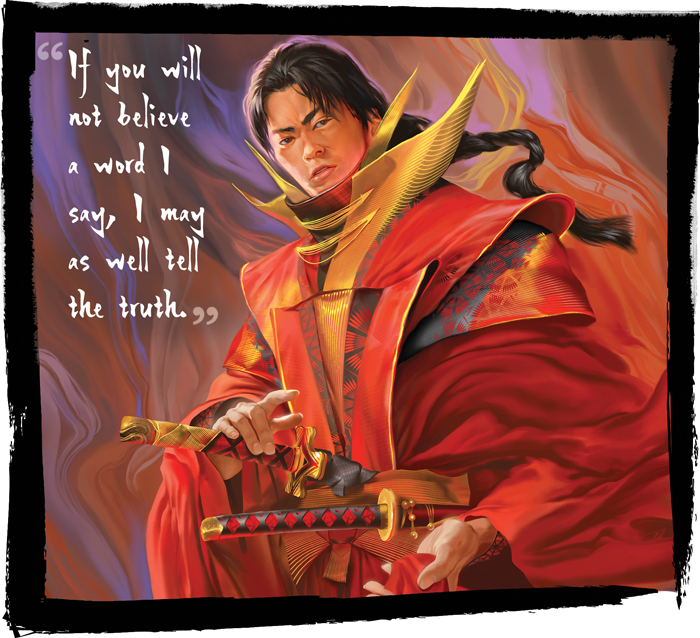 The first is the Honest Scorpion himself, Bayushi Yojiro (Whispers of Shadow and Steel, 3). In his role as a Magistrate, Bayushi Yojiro manipulates the rules of conflicts, in this case nullifying status tokens on each character during a conflict. The Scorpion tend to dishonor themselves, but with Yojiro on the field, he can cover their weaknesses as one of the Empire’s most trusted Magistrates. Play Bayushi Yojiro in style with three copies of this exclusive full-art character! However, status isn’t the only weapon the Scorpion utilize. 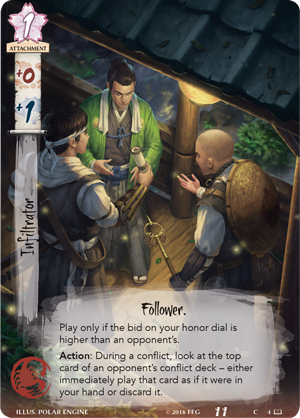 The Infiltrator (Whispers of Shadow and Steel, 4) is a Follower attachment that can only be played when your honor bid is higher than an opponent’s. As an Action, you may look at the top card of your opponent’s conflict deck and either play that card or discard it. The Scorpion are experts at using their enemies' assets for their own means, and the Infiltrator is the perfect tool to discover these opportunities. As an attachment, you can repeat this process every turn, so long as your Infiltrator is in play. Discover your opponent’s weakness with three copies of this full-art attachment included in Whispers of Shadow and Steel! Every Scorpion knows their duty is paramount. But when the Honest Scorpion’s loyalties are tested, who will he betray? What choices call to Bayushi Yojiro? Find out in Whispers of Shadow and Steel! Discover the meaning of duty with Whispers of Shadow and Steel (L5N02), available now from your local retailer or our website!